Quarterback Drew Brees continues to make his case for MVP as he leads what appears to be an unstoppable New Orleans Saints‘ offense, but some lesser-known players have stepped up on defense (and offense) in a big way to ensure the wins keep coming. In the Saints’ Thanksgiving night win over the Atlanta Falcons, interior defensive lineman Sheldon Rankins and linebackers Demario Davis and Alex Anzalone combined for seven stops and nine pressures. For comparison, the Falcons managed just 12 stops and eight pressures as an entire defense. 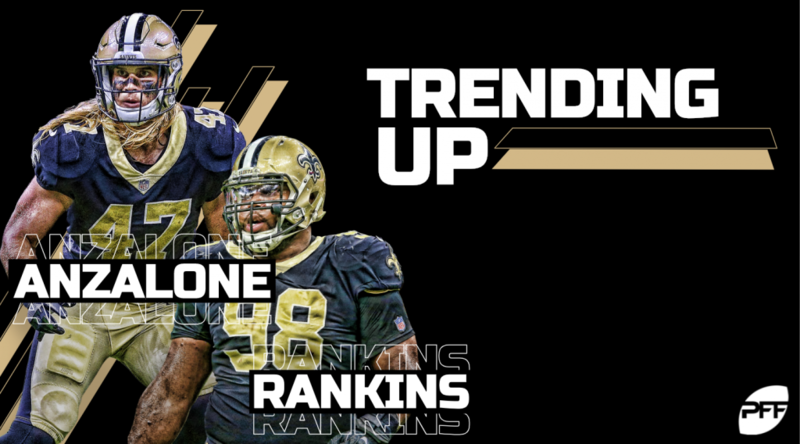 Rankins’ success is the most intriguing of the three players, as the former first-round pick has revitalized a career that was in shambles in 2016 and 2017. Despite being on pace to play fewer snaps than last season, Rankins has already racked up six sacks, a new career-high. While the “bust” label is quickly applied to first-round rookies who aren’t immediately the best at their position, Rankins has shown that he’s progressed with time — as many rookies do. His 11.0 pressure percentage ranks 11th among defensive tackles — ahead of stars such as Cameron Heyward and Ndamukong Suh. Also, for what it’s worth, Rankins is one of five interior defensive linemen with 400 or more snaps who has yet to be penalized on the year. Rankins had shown flashes in 2016 and 2017 of what he was capable of — he had missed just two tackles on over 1200 snaps in that span and accumulated 50 pressures a season ago. For Rankins, it was simply a matter of finding success in all facets of the game. This season, his current 75.4 overall grade in combination with a 69.3 run-blocking grade and 71.2 pass-rushing grade would all be career-bests, as well as emblematic of a player who has figured the game out in his third year out of Louisville. Davis and Anzalone, on the other hand, have become a formidable pass-rush duo from the inside linebacker position, ranking fourth and 10th, respectively, in total pressures. Those numbers are slightly skewed due to only six teams having played this week, but both are generating pressure on about 25 percent of their pass-rush snaps — the league average for inside linebackers is 16.5 percent. Not only that, but both linebackers are sporting grades above 70.0, and if those grades hold, they would be career-highs. While Anzalone is playing on just 42.5 percent of the team’s defensive snaps, the second-year man has shown a particular strength in pass coverage, which is a facet most linebackers get burned in. He’s allowed a catch percentage of 75 percent, but the 12 receptions he’s allowed in coverage have gone for only 110 yards. His 0.92 yards per cover snap rank 17th among 51 inside linebackers with 100 or more snaps. He’s yet to allow a touchdown this year and even has an interception. The yards per cover snap ranking is obviously not overly impressive, but the Saints should be pleased with his efforts to limit the damage when he does have to drop back. So while Cameron Jordan continues to shine on defense and Brees shows no signs of aging, the Saints are being helped immensely by underrated players across the board, even on offense where four undrafted receivers caught touchdowns against the Falcons. Their Super Bowl hopes are soaring, and much of it can be attributed to the supporting cast.